When I was a kid, some of my favorite summer memories involved swimming and summer camp. As soon as school let out, I jumped at the chance to spend all day outdoors, learning new skills and meeting new friends. Times may have changed since I was growing up. But there’s Stephen Terrell, Mayor still something special about CITY OF ALLEN summer—especially when you spend it with Allen Parks and Recreation. In this guide you’ll discover page after page of unique activities to make this season unforgettable. Kids can enjoy camps focused on classic skills like fishing and cooking, or more tech-savvy subjects like video game design and digital photography. And for those sizzling afternoons, you’ll find a fun and affordable spot to cool off and have a splash at the beautifullyupdated Ford Pool. Of course, no summer would feel complete without my favorite tradition for kids and grown-ups alike, Market Street Allen USA Celebration at 4:00PM on Saturday, June 29 at Celebration Park. This citywide party brings together the best parts of every good summer bash: delicious food, great music and a stunning fireworks display. It’s a great way to celebrate the thing I like most about summer: the chance to spend more time with the people we love. Who We Are MISSION Enhancing lives and enriching the community through Parks and Recreation experiences. Allen Parks and Recreation Department is a recipient of the 2016 National Gold Medal Award for Excellence in Park and Recreation Management presented by the National Recreation and Park Association. Celebrate Independence Day in Allen with live entertainment, fun festivities and spectacular fireworks! Read more about Market Street Allen USA Celebration on page 23. Allen Community Ice Rink Ice skating and hockey arenâ&#x20AC;&#x2122;t just winter sports! Open year-round, Allen Community Ice Rink offers a diverse range of events and provides opportunities to skate in costumes, with clubs and for charitable causes. Whether youâ&#x20AC;&#x2122;re a rookie or veteran, come put on some skates and hit the ice! Facility Hours* M-F	6:00AM-9:30AM SA	8:00AM-5:00PM 3:00PM-8:00PM SU	12:00PM-5:00PM *Facility and open skate hours vary depending on season and programming. Call front desk for information. For savings, purchase punch cards at ACIR Front Desk. Rentals See pages 74-75 for information. Amenities Find Ice Rink programming on pages 68-69! Allen Senior Recreation Center Offering unique programs, classes and trips, Allen Senior Recreation Center is the perfect reminder that at age 50 and better, lifeâ&#x20AC;&#x2122;s just getting started! Make new friends while playing billiards and ping pong. Learn new skills or improve on current ones. Avoid crowded gyms by utilizing the fullyfurnished fitness room. Daily Lunch Freshly prepared meals are served MondayFriday from 12:00PM1:00PM for members at the cost of $4 per meal and $3 for a garden salad. Pre-registration is required no later than 9:30AM on the same day. Find Senior programming on pages 54-58! Want to find out more about ASRC? The CenterLink is a bimonthly newsletter featuring all upcoming programs, events and trips. The CenterLink is available at ASRC and online at LifeInAllen. org/ASRC. *Resident rates include Allen residents and employees working for businesses, corporations and organizations in the city limits. See pages 74-75 for information. Don Rodenbaugh Natatorium Swimming the lazy river and playing in one of Allenâ&#x20AC;&#x2122;s largest indoor pools are exciting aquatic experiences that all ages can enjoy at Don Rodenbaugh Natatorium! Children can make friends on the play structure and flume slide. Adults can improve fitness in group classes. *Closed on T/TH but open during AISD Holiday Schedule. Children 6 and younger must have an adult in the water with them at all times. Children 10 and older may be dropped off by parents. Membership also includes the use of JFRC. *Resident rates include Allen residents and employees working for businesses, corporations and organizations in the city limits. WATER EDUCATION Lifeguard Training CPR/First Aid Water Safety Instructor LEARN TO SWIM Minnows (Ages 3-5) Sharks (Ages 6-12) Parent/Child Aquatics Adapted Aquatics Adult Lessons WATER FITNESS Deep Water Courses Power Splash River Robics Shallow Water Works Total Fitness SilverSneakersÂŽ LAND FITNESS Chair Yoga Pilates Yoga Zumba Core Endurance Personal Training LEARN MORE For more information, visit LifeInAllen.org. Ford Pool Go for a swim and have fun in the sun this summer at Ford Pool! Make memories with family and friends at the pool’s special events held throughout the season. Relaxing under the cabanas, swimming laps, enjoying the new play structure and sliding down the 20’ slide are just a few of the exciting things you can do at one of Allen’s largest outdoor pools. *Open daily Memorial Day weekend through Labor Day weekend. When school is in session, Ford Pool is only open on the weekends. Rentals See pages 74-75 for information. Find JFRC programming throughout the guide in the Special Events, Camps, Young Children, Youth and Teens & Adults sections! Without Member $7 Children 17 and younger must be registered for the daily admission pass by an adult 18+. Book your tee time at WattersCreekGolf.com! The Traditions Course This stunning 18-hole course is great for just about any golfer at any skill level. The championship course has been significantly upgraded aesthetically with increased playability. The Futures Course The 6-hole short course is laid out for players to perfect their short games and for new players to ease into the game of golf with a comfortable and enjoyable experience. The Players Course Modified in 2013 to appeal to juniors, women, beginners and anyone who wants to â&#x20AC;&#x153;get in a quick 9-holesâ&#x20AC;? of great golf. The Players Course is perfect for the experienced golfer, too. FootGolf Course The Courses at Watters Creek offers a 9-hole FootGolf course! FootGolf is a combination of soccer and golf. Find Golf programming on pages 70-71! WattersCreekGolf.com Course and range hours vary; please check website. The Edge Riding a skateboard, scooter, BMX bike and inline skates on handrails and a picnic table is encouraged at The Edge, one of Texasâ&#x20AC;&#x2122; largest outdoor skate parks. When taking a break, hang out with other extreme sports enthusiasts in the visitor centerâ&#x20AC;&#x2122;s media room, game room and snack bar. Take advantage of the high-flying fun year-round! The Edge Facility Hours M-F	3:00PM-8:00PM SA	12:00PM-8:00PM SU	1:00PM-6:00PM *Open at noon during AISD school holidays. All outdoor activities at The Edge are considered high risk activities. Safety equipment including but not limited to helmets, and knee and elbow pads are strongly recommended. Fees are not charged for the use of the outdoor amenities or the main lobby area of The Visitor Center. BMX Track, In-Line Hockey Rink and Skate Park rules and regulations available at LifeInAllen.org. Fees are not charged for the use of the outdoor amenities or the main lobby area of The Visitor Center. Must be within the facility age range. See pages 74-75 for information. Find The Edge's programming throughout the guide in the Special Events, Camps, Young Children, Youth and Teen & Adult sections! END OF SUMMER OF BASH! What could be better after a long day than spending the evening with family and friends over a picnic dinner on the lush, fresh grass of the Joe Farmer Recreation Center Amphitheater while enjoying live music filtering through the evening air? The music will range from contemporary pop hits to classical and more. All Summer Sounds concerts are FREE and begin at 7:00PM. Ground blanket seating is preferred so that concert-goers of all ages can enjoy the best line of sight. In-N-Out Burger® will be providing FREE burger meals to the first 1,000 guests on June 3, 10 and 24. Also, a special Food Truck Day will be held on June 17 with a variety of delicious meal options available! To prevent event or program cancellations, please register at LifeInAllen.org at least one week prior to start date. Each week is a new adventure guaranteed to have your camper making new friends and having fun in the sun! This day camp will include a variety of indoor/outdoor activities, games, field trips, and more! For more info, call 214.509.4750. MAD SCIENCE: NASA YOUNG ASTRONAUTS! A breath of fresh news. City news coverage Community events Construction reminders Crime and safety alerts ...and more! To prevent class or program cancellations, please register at LifeInAllen.org at least one week prior to start date. Performing Arts JAZZ IT UP! Register for programs and classes online at LifeInAllen.org. 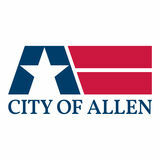 City of Allen Financial Assistance Program Mission of C.A.R.E. (Citizen Assistance for Recreation Experiences): To provide recreational opportunities through financial support to qualified Allen residents in order to promote citizen involvement, build a strong sense of community and increase social and physical well-being. Allen Parks and Recreation Department offers financial assistance for qualified residents. Financial assistance is available for most recreational programs, classes and memberships offered at JFRC, DRN, TE, ASRC and Athletic Programs. It does not include league fees. Request an application packet by contacting Travis Cunniff, Recreation Services Manager at 214.509.4700. Allen enjoys a thriving local park system that provides residents with the ability to enjoy an active outdoor lifestyle. Find out about park classifications at AllenParks.org/ParkClassifications. RIDGEVIEW CROSSING PARK Allen’s newest neighborhood park stands out with a brightly colored playground and pavilions, loop trail and plenty of open space to run around and play in. SPIRIT PARK Allen's new 75-acre community park has a lighted softball complex, playground called "The Hideout," pollinator garden, 25 acres of natural wooded area, trail loop and more! HISTORIC WATER STATION Experience the history behind what put Allen on the map through interpretive panels overlooking the scenic Historic Dam and Water Station. SNAP your fingers and shuffle your feet at this Special Needs and Adapted Program! Enjoy music, a fun theme and snacks. Register early to avoid a fee increase. For more info, contact Julio Rodriguez at jurodriguez@cityofallen.org or 214.509.4754. This course trains participants to teach swimming lessons through the American Red Cross with a focus on critiquing and evaluating a studentâ&#x20AC;&#x2122;s progress. Participants will receive a certificate via email upon successful completion of the course. To prevent class or program cancellations, please register at least one week prior to start date. ASRC PUNCH CARD Allen Senior Recreation Center offers Punch Cards for Line Dancing, Pilates, Yoga and Zumba classes. Must purchase at the ASRC Front Desk and give the punch card to the instructor before each class you attend. Cards are non-refundable and non-transferrable. Lost cards will not be replaced. All cards will include a six-month expiration from the date of purchase. This course will re-certify individuals in American Red Cross lifeguarding, blood borne pathogens training, emergency oxygen, CPR, first aid, AED. Participants will receive a certification upon successful completion through email. Improve your water confidence and stroke technique with our certified Water Safety Instructors. The improvement of aquatic comfort level is mastered through small group focus on personal achievements. All skill levels are welcome. To prevent program or class cancellations, please register at LifeInAllen.org at least one week prior to start date. Go for a swim and have fun in the sun this summer! Discover special events at Ford Pool on page 61. Competitive Stroke Clinic This program prepares swimmers for competitive swim team environments. A FREE skills assessment (times available at Don Rodenbaugh Natatorium) must be completed before registering. Swimmers new to stroke clinic are preferred to register on Monday/ Wednesday. Your child can learn to swim with our certified American Red Cross Water Safety Instructors. Students will be evaluated on the first day of class then placed with an appropriate group based on their American Red Cross level. teamsideline.com/allen Registration packets, league schedules, standings and free agent information can be found on the Athletics website. 15 YEARS-ADULT REGISTRATION: Call the ACIR Front Desk at 972.912.1097 or reigster in person at Allen Community Ice Rink. Golf The Plane Truth Golf The Plane Truth Golf instructor group is one of the most prominent in the golf industry today. Our world-class program has produced tour winners, Olympic medalists, and Fed-Ex Cup Champions. Our team offers instruction to all ability levels from PGA Tour professionals to recreational players. Over the past five years, The Plane Truth Junior Program at The Courses at Watters Creek has produced numerous winners of local junior events. Our students regularly compete in PGA Tour, Asian Tour, International Juniors, US Kids Golf, NTPGA, TJGT, & AJGA tournaments. Visit PlaneTruthWattersCreek.com for more details. This program is designed specifically for players, with little experience, who have the goal to play high school golf. Players will receive a dedicated practice program that includes individual and group coaching sessions, on course playing lessons, short game skill improvement and overall game development. (15 hours of instruction and practice per week is required). The Futures Team is designed for young athletes interested in starting the game of golf. Team members will play regularly on our six-hole par three and nine-hole golf courses. Each participant will graduate from this team with an improved skillset and friendships for a lifetime. The Girls Team is designed to create an environment to grow passion and love for the game, have fun and build friendships with golf and improve golf skills. CONTACT 224.343.6801 OR JAKE@PLANETRUTHGOLF.COM FOR INFORMATION ON THE PLANE TRUTH GOLF PROGRAMS. Sign up today for this program at The Courses at Watters Creek! For more information, visit the Golf Shop or call 214.509.4653. Reservations A number of pavilions are available for rent through Allen Parks and Recreation. All pavilions are available on a first come, first served basis. A $50 deposit plus hourly fees are required. A complete list of Pavilion Rental Rules and Regulations will be provided upon reservation confirmation. PLEASE KEEP IN MIND: •	None of the pavilions have patron accessible electricity. •	There is a $50 refundable damage deposit for each rental. •	No tobacco products, firearms or alcoholic beverages are allowed on premises. •	There is a two-hour minimum for each rental. For more information, please call 214.509.4714. Bounce houses are welcome in City of Allen parks and require an additional $25 fee charged upon notifying the Parks and Recreation department of your plans. Once confirmed, staff will then mark a safe spot (away from buried electrical lines, irrigation, etc.) for bounce house set up. Proof of insurance must be provided by bounce house vendor. Facility Rentals Rental packages range f rom $20-$325 per hour. Contact individual facilities for details! Registration Dates All class and program registration begins at 8:00AM online or at Joe Farmer Recreation Center or Don Rodenbaugh Natatorium. Walk-in registration accepted during regular facility hours. Online registration is available 24-hours a day, seven days a week! Been a customer within the past year? Your account may have already been created in the new ACTIVE Net system. Use youremail on file as your login and click "Forgot Your Password?" OR If you do not have an account, click "Create New Account". If you have questions or to receive more information, call 214.509.4750 or 214.509.4770. Mail-in registrations are accepted up to one-week prior to a class start date. Indicate credit card information on the registration form or include a check or money order payable to the City of Allen. FI ND REGI STRATI ON FORM S ONLI NE AT A LLENPA RKS .ORG . All program fees are set according to the cost of the instructor, supplies and minimum class enrollment. All fees collected help support and finance programs. Some programs may require additional fees or supply fees and may be offered at member and non-member rates. These fees are generally identified in the program description and are to be paid directly to the instructor. Is your class full? If so, we can place you on a waiting list. We will notify you if a space becomes available or a new class is formed. Payment is not required until you are registered for an open class position. Participants may transfer to another available class before it begins without charge but only if the enrollment for the class transferred from will not drop below the minimum. By registering for a class there is an assumption of risk by the participant. The Allen Parks & Recreation Department is dedicated to providing safe facilities and equipment for all participants, as well as qualified staff and instructors. In the event of a serious accident or illness, it is City policy to contact: •	The Allen Fire Department Emergency Services to perform First Aid and when necessary, recommend transport to a hospital. •	Each parent or legal guardian as soon as the situation allows. Due to the structure of child/parent classes, only children who are of the appropriate age for the class will be permitted to register and attend the program. No younger or older siblings will be allowed in the classroom to sit and watch or be left unattended in the lobby. Please refrain from entering the teaching area during class to eliminate interruptions between the instructor and participants. There will be special days to view your child’s progress. Staff or hired photographers may take photos of class participants. The photos may be used for City of Allen promotional purposes in the Activity Guide, brochures, flyers, news releases or the website. Customer service is our top priority! If you are not satisfied with a class, please let us know immediately so we can correct the situation. If you need to request a refund, please contact an Allen Parks & Recreation Department facility. •	Participation is not possible due to class cancellation or a change in day, time or location. Refunds will not be subject to any administrative charges. PARTIAL REFUNDS WILL BE ISSUED IF: •	Participation is canceled after the class starts due to unusual circumstances (e.g. sickness or injury). The refund will be prorated minus charges for furnished supplies. All partial refunds are subject to a $10 administrative fee. •	Participation is canceled regardless of reason with notification of five (5) or more calendar days before the class starts. •	Participation in any program is canceled with less than five (5) calendar days notice and we are able to fill the vacancy prior to the start of the program. Participation is canceled with notification less than five (5) calendar days before the class starts and we are unable to fill that vacancy. 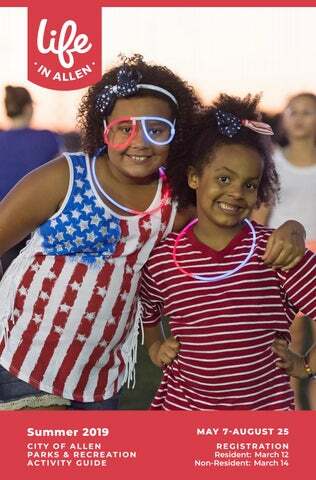 MAKE MEMORIES AT ALLEN'S SUMMER EVENTS! LEARN MORE ABOUT THESE FREE SUMMER EVENTS AT LIFEINALLEN.ORG!